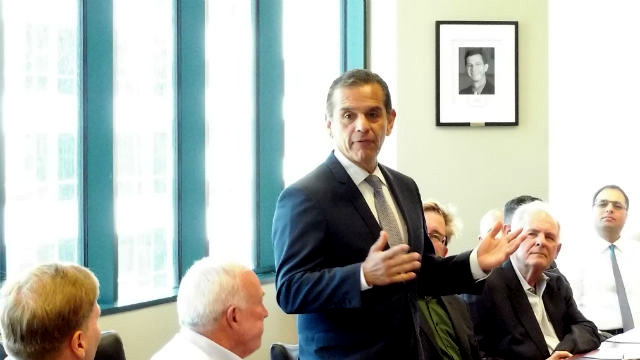 California gubernatorial candidate Antonio Villaraigosa told San Diego business leaders Wednesday his track record as mayor of Los Angeles proves he can tackle the state’s most difficult challenges. He cited a list of similar tough challenges facing California, including excessive regulation, lack of training for an increasingly technical economy, limited affordable housing and crumbling infrastructure. Polls show Villaraigosa, a Democrat, running second or third after Lt. Gov. Gavin Newsom, also a Democrat, and Republican John Cox, a Rancho Santa Fe resident and newcomer to California politics. The primary election is June 5. “Right now I’m fighting for second. That’s a fact,” Villaraigosa acknowledged. Bullet Train: “I see it as an engine for economic development,” but “we’ve got to value-engineer it” and find a private partner. Villaraigosa was mayor of California’s largest city from 2005 to 2013 and before that served in the state Assembly, ultimately becoming speaker and earning a reputation for bi-partisan leadership.